It’s odd that during the holiday season, after three years after being cured, I still think about hepatitis C. Many years ago, a blood transfusion that saved my life may have been the route to my disease. Or my infection may have been the result of a horrendous incident with bikers. Or perhaps there was transmission in my family, when I was young. Twelve weeks of two of the earliest direct-acting antivirals led to my SVR in January 2015, but the puzzle of my infection lingered. I decide to investigate. That led to a book about my journey with the disease and the pharmaceutical research that led to anti-viral cures. This past summer, Greystone Books published Demon in My Blood. I thought that getting my story out—in a big way—would end my thoughts about the disease. Yet I continue to worry about my liver. It has regressed back to normal, from being near cirrhosis during my infection. That gives me confidence, but not certainty. I slipped walking on the beach this fall and then felt a pain in my side. It kept me awake at night for more than a month. I wondered whether the pain was not actually a bruise or a torn rib. Might it have been some residual damage to my liver? Entering the holiday season, I worried about parties I would attend. I had gone back to having a glass of wine now and then about a year ago. But it’s too easy to accept a refilled glass when someone carries a bottle to the table offering another round. Would another glass be good for me? Would there be unknown jiggers of vodka in the punch? Occasionally I just get pain in the right side. But I have digestive problems unrelated to hep, which can create pain that seems like it’s coming from the liver. My doctor said to see him if the pain becomes steady. So I continue to worry about hepatitis C, and I keep to a healthy-liver diet. But the good news is and always will be that I’ve been cured of hep C—and that cures are available for everyone, once they are diagnosed. Every year more people are cured–and 2018 should see a decrease in the number of infected people worldwide. That’s good news for the new year. May you have a happy one. Hepatitis C may have done one good thing for me. It may have lowered my cholesterol for a while–or maybe being cured ramped it up. The chart shows an early 2014 blood test I had before I was treated with direct-acting antivirals that summer. 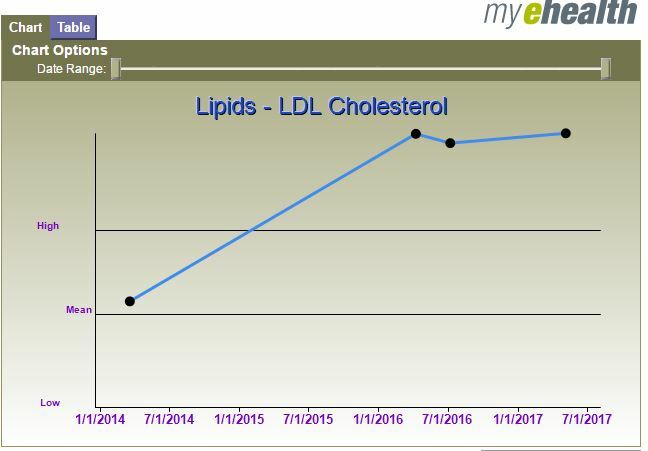 The next three dots on the chart show my bad cholesterol after my treatment and cure. I may have inherited a propensity to high cholesterol from my dad. He died of heart failure, and I have no other risk factors. Perhaps, as research suggests, hepatitis C may have lowered or stabilized my inherited build up of cholesterol. The liver eliminates cholesterol through bile, and the liver changes after treatment. There’s a possibility that my liver, which regressed from fibrosis, never regained strength in cholesterol clean-up. I’m no longer worried about my liver, but I’m worried about my heart. It’s time to get out and exercise, get rid of fatty food, and keep on top of this new health risk. Those who have been cured of hepatitis C still need to be tested–for cholesterol. Most people who learn they have hepatitis C become more conscious of what they put into their bodies, especially the substances that are good or bad for the liver. Tumeric powder comes from a root. Today I’m thinking of one good and one not-so-good substance, both beginning with the letter T: turmeric and Tylenol. I’m thinking of turmeric because I am replenishing my spice shelf and have come to regard the yellow spice as one of nature’s gifts for liver health. As for Tylenol, after having been cured of hep C for two years, I’m thinking of trying it again. Tumeric powder, which I use as a spice, comes from the root of the turmeric plant. You can grow it in your garden and keep it there through the winter, if it doesn’t get too cold. Tumeric stays hardy in zones 7b – 11. In the summer, it will grow white, tropical-looking flowers. Studies have shown that turmeric tends to raise HDL (good cholesterol), which reduces LDL (bad cholesterol) and the strain it puts on the liver. A German study in the medical journal Gut concluded that turmeric inhibits the hep C virus from entering liver cells. My hep is gone, but cholesterol threatens my heart, so I will keep using turmeric. Also, I like its taste in cooking. Tylenol, which has been shown to be safe for the liver in doctor-recommended doses, can injure the liver with indiscriminate use. Tylenol overdose is among the leading causes of liver failure, and the amount that would cause overdose may not be the same for everyone. Before I was diagnosed with hepatitis C I noticed that Tylenol upset my stomach, so I asked my doctor for other drugs for pain relief. That was lucky for me. Even if Tylenol would have done me no harm, I would have been worried about it throughout my treatment. Now that I’m better and my liver has regressed, my doctor says there’s nothing wrong with Tylenol. For normal aches and pains that I’d rather avoid, I’m considering it. Since my hepatitis C cleared after treatment with direct-acting antivirals, my liver went back to normal. My alcohol habits regressed somewhat too. I stopped drinking entirely when I was infected with hep, but now I’ve gone back to drinking a glass or two of wine on the weekend or when guests come by for dinner. Still, I remain wary about alcohol. I usually enjoy my beverage as a spritzer: half wine, half soda water. According to the U.S. Department of Veterans Affairs, the average man who is infected at age 40 or later and drinks a lot can expect a cirrhotic liver in thirteen years. The slowest progression occurs among non-drinking women under 40 who contract the disease early. It can take 40 years before their disease turns deadly. But again, those are averages and everyone is different. The best bet for anyone who has hep is to drink no alcohol at all. For those who have been cured, be very cautious. I’ve always loved black licorice. My family, who prefer chocolate, thinks my craving for the black, rubbery treat is odd, but being nice people, they often bring me licorice for birthdays and other celebrations. 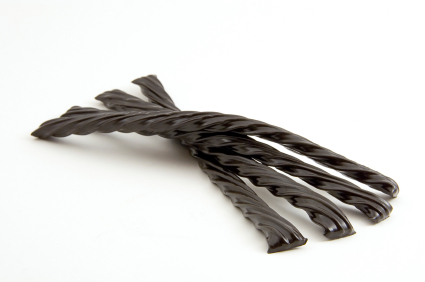 It turns out that licorice may be good for people with hepatitis C. My sweet tooth for the treat may have fended off the worst of the disease. The U.S. Department of Veterans Affairs says there’s evidence that licorice root (the flavoring in most black licorice candies) may reduce liver damage in people who have hepatitis C. Glycyrrhizin, an acid that gives licorice its sweetness, may help prevent liver cancer, the department says in its website. A study in the Journal of Viral Hepatitis that tested glycyrrhizin on patients with hepatitis C found significantly lower ALT levels and inflammation among test patients. Veterans Affairs warns, though, that licorice root supplements may lead to high blood pressure and ascites (a build up of fluid in the abdomen), which can increase with cirrhosis. It can also be harmful to eat the candy. According to the Federal Drug Administration, eating two ounces of black licorice per day for two weeks straight can disrupt your heart beat and send you to the hospital. If you are considering taking licorice root extract, first ask your doctor. As for me, on special occasions I still eat twisters. Greystone Books, which will be publishing my book on hepatitis C, has come up with a cover. I think designer Peter Cocking did a fantastic job. The book will be launched in early 2017. I’ll let you know when I learn the specific date. It’s all in the hands of Greystone, which is doing excellent work in getting this book ready for production.